I kind of accidentally insulted one of my favorite websites on Twitter yesterday. Yesterday afternoon, Hillary Clinton announced her campaign for the Presidency online. 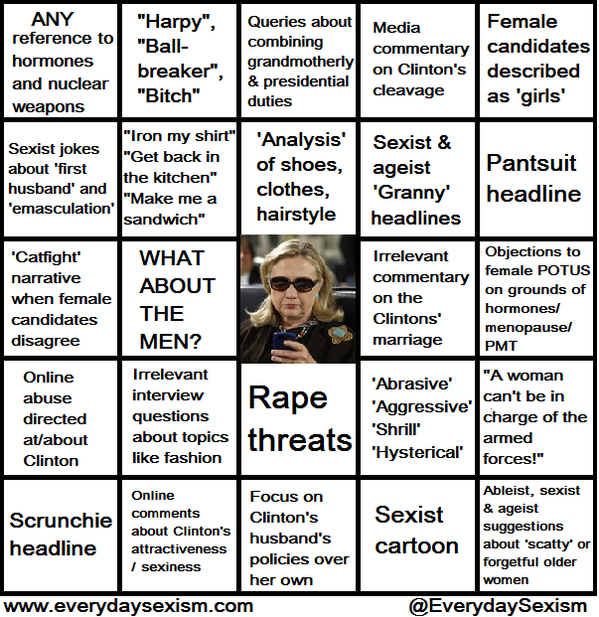 Phil Plait (a very good @BadAstronomer) retweeted @EverydaySexism's Everyday Sexism Bingo Card for it. I saved it, and replied: "@EverydaySexism @BadAstronomer Saved that image. I read @fark, so I'll likely fill it in the next 20 minutes or so." About 5 hours later @Fark replied with "@beaver1224 @EverydaySexism @BadAstronomer :("
When I saw the frowny face, I realized that I had not quite conveyed my meaning. D'oh! There is no color for stupid. 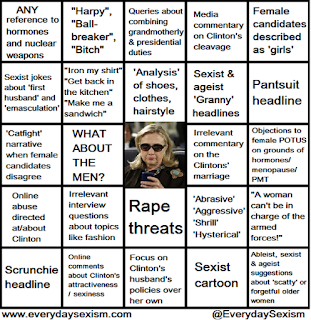 However you feel about Hillary Clinton, you cannot deny that there will be tons of these will be lobbed about. Were they arrows, we would be able to eat in the shade for the next year and a half. The "safest" place to fire the arrows of everyday sexism from is the anonymity of the internet. But there are all too many people - some of them policy-makers, some of them people that influence policy-makers - that will fire away without even that anonymity. I like to describe Fark as "a news aggregator site with attitude." If something interesting, stupid, funny, cool, unlikely, scary, or just Florida happens, it's almost certain to be on Fark. I am there every day. I am, in fact, a TotalFarker, paying for the privilege of seeing (and commenting) on these stories before they go before the public, so to speak. Fark has a very diverse community, even among its pay subscribers. There are a lot of very cool people there; there are a lot of complete idiots there; there are a lot of trolls there. Some of those groups overlap. So here's the thing. I am fairly certain that hate will be spewed at Mrs. Clinton. I am fairly certain that some of that will hit the news. I am fairly certain that some of it will be reflected in the comment threads of most or all of those articles. I am also fairly certain that those hateful comments will be called out, ridiculed, and lambasted in those threads. Fark is not a bad place, it's a great place, but it is an internet place. Hateful things unfortunately happen on the internet, but positive things often follow. @Fark, I'm very sorry I didn't think to find a way to stuff that into 140 characters. I'm sorry I didn't think to just shut up. I'm sorry that I didn't think much at all, really. I still love you. Can we be friends?